Kanye is clearly referencing the recent Securities and Exchange Commission lawsuit against Musk for alleged securities fraud concerning a tweet the Tesla CEO posted back in August that claimed he had secured funding to take the company private. The SEC claims that and other public comments from Musk were either false or misleading, and Tesla and Musk settled with the feds, forcing Musk to step down as Tesla chairman but remain as CEO. The scandal was only proliferated by a series of claims on social media from artist Azealia Banks, who was in the Musk household while all of this was going on for a failed collaboration with artist Grimes, who was dating Musk at the time. Banks is likely who Kanye is referencing when he says he doesn’t care who was at the Musk’s house, though it’s unclear how much impact, if any, Banks’ statements had on the SEC investigation. Clearly this has Kanye upset, as he sees it interrupts Musk’s vision for innovation. Back in 2015, Musk wrote about Kanye West for Time’s 100 Most Influential People list. As the Detroit Free Press points out, Kanye visit to Detroit also stopped at One Campus Martius with StockX CEO Josh Luber, who is headquartered there, and Quicken Loans founder and chairman Dan Gilbert, who also has an office there. In the videos from one of Kanye’s the posted to his accounts, you can see various projects including automotive designs, an interactive 3D model of Detroit, a giant iPhone, and more. The College for Creative Studies is a private arts school and is home of the Henry Ford Academy. Its alumni include Ralph Gilles, Senior Vice President of Design at Chrysler and Joel Piaskowski, director of design at Ford, among others. 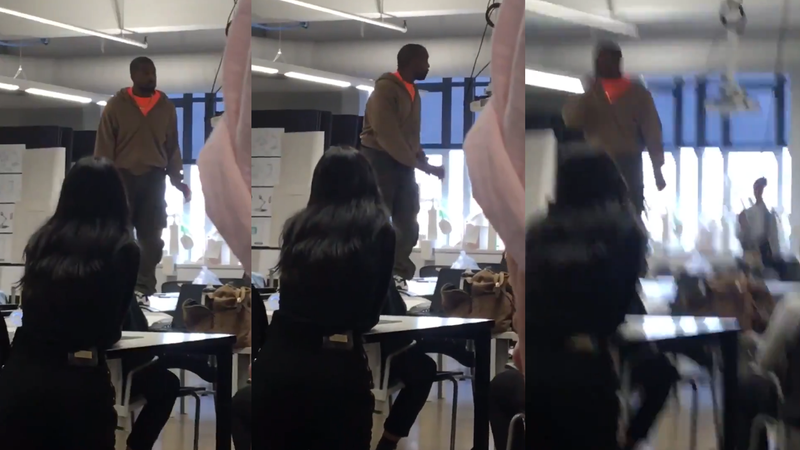 Kanye also tweeted out seemingly asking Gilbert where the “flying car department” is at the school. Kanye’s visit to the college follows a weekend of controversy, with the rapper delaying the release of his new album, posting a photo of himself in a custom red “Make America Great Again” hat, tweeting about abolishing the 13th Amendment, and performed on Saturday Night Live, where he reportedly went on a rant off-air about the SNL producers and audience bullying him over his support of Donald Trump. Regardless, Kanye may get his wish of people leaving Musk alone in his new reduced capacity at Tesla, but the biggest help would be convincing Musk to just stop tweeting so much.